Work With America's Most Trusted Installer! Energy efficiency & savings – Up to 40% off current energy bills! Spray foam insulation provides lasting comfort to you and your family, and can reduce your heating and cooling costs by up to 40%, increase the value of your home, and extend the life of your HVAC system. Spray foam comes in two types, open cell and closed cell, which are equal in energy saving ability, but have unique benefits. Open cell foam is leading sound proofing insulation, while closed cell foam is rigid and strengthens the structure as it cures. For more information on our spray foam insulation and its benefits, contact us at 843-388-6260. Energy One America offers reliable services and protections from many household threats – but perhaps the most dangerous of these is mold. Mold can be hard to see and difficult to detect, and unchecked, can pose a serious health hazard. Our Forticel mold prevention treatment is the ONLY treatment on the market with a fully transferrable 25 year warranty. Most other treatments void your warranty if the treated surface gets wet, just when you need it most! Forticel Mold Prevention is guaranteed to stop mold growth on all treated surfaces for 25 years, making it the first choice for premier residential and commercial builders. 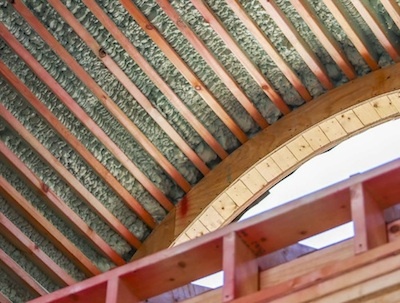 Is Spray Foam the same as “sprayed in” or “blown in” insulation? “Sprayed in insulation” is a commonly searched phrase and usually refers to Spray Foam Insulation. “Blown in insulation” usually refers to blown in cellulose, which is loose and lays on the attic floor, and is usually removed during the upgrade to spray foam. Other common search terms for spray foam insulation are: foam types, polyurethane insulation, polyurethane foam, expanding foam, roof spray, diy foam, foam roofing, and spray insulation. The R-Value varies depending on the depth of the application and the type of foam used. The characteristic that makes spray foam the optimum solution for insulating is its ability to air seal the space in which it is applied. Fiberglass, blown in insulation, and cellulose may have a similar or higher r-value, but all of that is lost without a proper air seal. Spray foam is the only insulation that provides a thermal, air, and moisture barrier all in one application, making it superior to other insulation options. If my house floods, is my Forticel Mold Prevention warranty voided? No! In fact, Forticel Mold Prevention carries the only warranty that remains in place in the event of a flood or moisture intrusion. Other mold prevention products remain valid as long as the treated surface does not get wet. Call the Energy One America team today at (888) 907-3090 to learn more about how our services can protect your home and improve its energy efficiency! We service homes in cities throughout the Southeast, in South Carolina, Georgia, North Carolina, and beyond, including Charleston, Mt. Pleasant, Daniel Island, James Island, Kiawah Island, Isle of Palms, Hilton Head Island, Bluffton, Savannah, Myrtle Beach, and Greenville.